With 4 weeks to go until the Weston A. Price Foundation‘s 2012 Wise Traditions conference, The Appropriate Omnivore continues its series of Wise Traditions speakers. 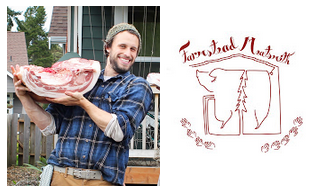 The speaker for this episode is Brandon Sheard, co-founder of Farmstead Meatmsith. Brandon went from being an English major to starting a meat business with his wife. Brandon’s job involves visiting small farms as a butcher. In addition, he teaches classes in on various topics such how to cure your meat and sharpen your knives. He explains what’s involved in all of this and how his cutting and curing makes for healthy and sustainable meat.